Keeping my word about actually trying to accomplish projects in March, I started tearing into the 1937 Grunow 588. 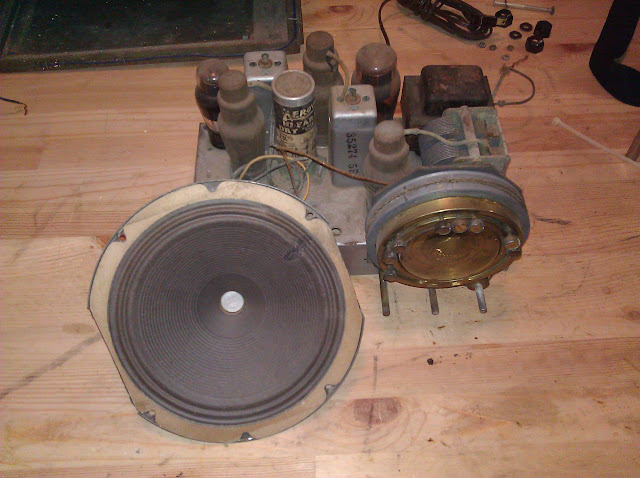 It’s vastly similar to the Grunow 589s that I’ve repaired in the past, the main difference being that it’s a table model radio and not a large console. 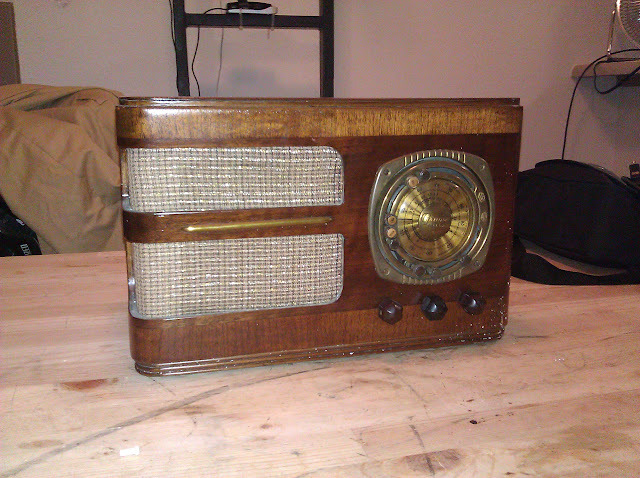 It’s also a five-tube radio with the line-up 6A7 6D6 75 41 80. The chassis stickers are in great shape. It’s always nice to find them in good condition. I also like how on this model, the antenna and oscillator trimmers are on the side near the transformer (for adjusting the alignment) – on the 589, they’re up in the front partially under the dial face which is more difficult to access. The chassis is pretty clean, just a little surface rust on the transformer and the tube shields with the rest in good shape. The underside shows evidence of having been worked on a few times. 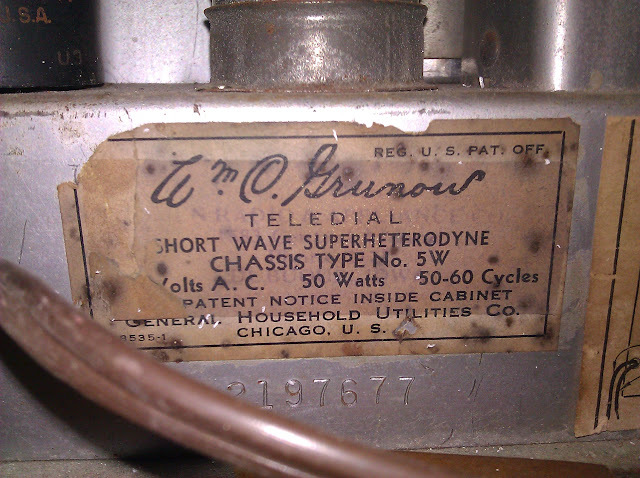 There are some of the original Grunow caps, and several ’40s, ’50s replacements, a ’60s or ’70s replacement and one from the ’90s. Other than needing to verify the wiring to ensure past repairs were correct, it’s nearly the same radio as the others and should be an afternoon’s project at most, maybe two if I take my time on it. I’ll be getting started on that in the next few days. 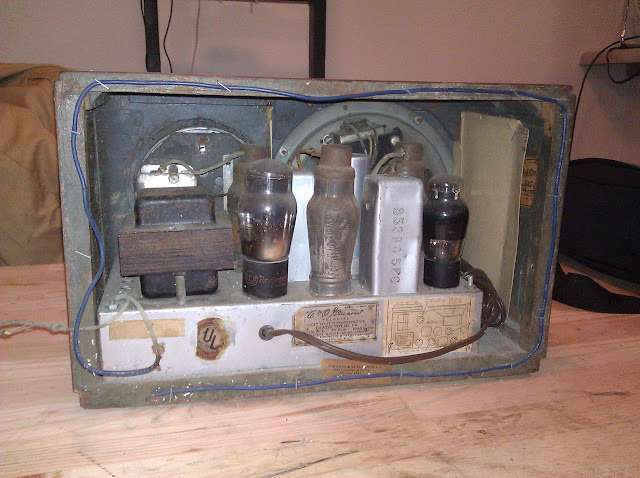 This entry was posted in Projects, Radios and Tubes, Vintage and tagged antique radio, chassis 5-W, grunow, Grunow 588, repair, restoration, vacuum tube. Bookmark the permalink. FYI for anyone repairing one of these, I just had Radio Daze make me a replacement Dial Scale for mine and now the Radio looks great.